We knew she was special and KushStock validated that by awarding her 🥈 in best Hybrid! After hunting down the finest, fruitiest genetics, Indoor Organic Gardens is proud to produce its Orange Sherbet strain. This cross of Orange Cookies x Sunset Sherbet pairs a delicious citrus terpene profile with beautiful, trichome-covered nug structure. 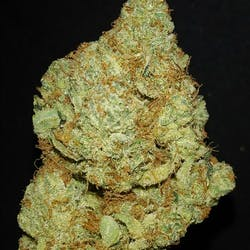 An intoxicating Sativa-dominant Hybrid, Orange Sherbet’s orange sweetness combines mental euphoria with a chilled out body buzz. Squash anxiety and pain alike with Orange Sherbet’s deliciousness. How i make send package for me? On this app not posible..
so clean and tasty! the smoke was nice and smooth ashes all white as always with that straight fire! a true organic experience cant wait for more! this strain is awesome think I may have found a new favorite!! HI MsPinkPeach, I didnt quite understand your comment but I definitely understand a 1 star review. Can I ask what you didnt like about the flower? Is there anything IOG could do better to fix the "issue" ? We pride ourself on customer service and delivering the best possible product to market. Thank you for taking the time to give us feedback.